Your shawl is beautiful - that pattern looks complicated! I'm impressed. It turned out beautifully, but sounds like it was quite the project!! Congrats on persevering and coming out with such nice results!! That is a beautiful shawl. Oh my goodness...love it. Those colours go so nicely together. Your shawl is very pretty. 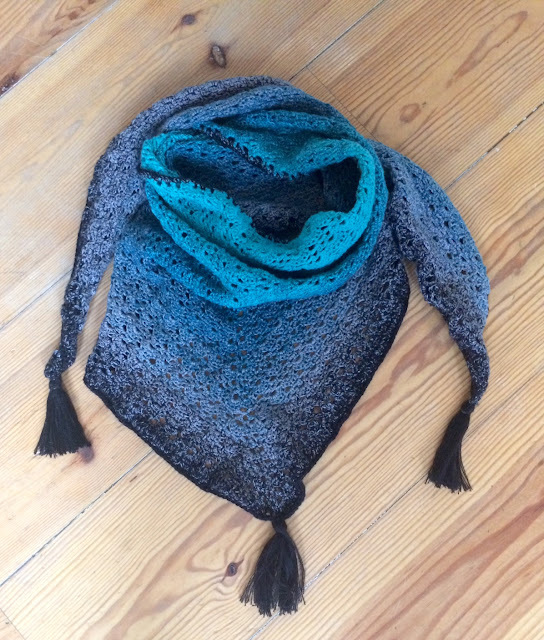 Beautiful shawl - both in color and crochet pattern! It's very pretty! I love the variations in color. Thanks for sharing with SYC. Sounds like a labour of love. I love the results, definitely worth it!